Though most people would automatically assume that the man labeled ‘The First Arab Terrorist’ has to be Osama bin Laden, it was actually Sirhan, Sirhan, the assassin of Robert F. Kennedy. Or was he? A new documentary, RFK Must Die, presents compelling evidence shockingly to the contrary, as the 40th anniversary of the assassination of RFK looms on June 5th. Irish documentarian Shane O’Sullivan isn’t merely out to be sensationalistic on this solemn occasion, with RFK Must Die. But he instead provides exhaustive research and persuasive reasoning that Sirhan’s personality would suggest that he was not only the most unlikely of assassins aside from his resentment against the US as a Palestinian-American, but that the CIA may have been involved, with a great deal of self-interest at stake. Wearing a number of hats in building his formidable case, O’Sullivan as filmmaker and incidental lawyer and investigative reporter, interviews government officials, forensic psychiatrists and hynotists, Sirhan family members, and CIA operatives. He also examines in great detail photos of the crime scene, and turns up notorious CIA assassins inexplicably loitering there who were responsible for covertly destroying governments around the world that were unfriendly to the US. Not only does O’Sullivan’s evidence support the theory that Sirhan, even though his gun was discharged, was not postioned close enough, but that the lethal bullets came from the opposite direction, possibly undetected because of a use of a silencer, a favored method of CIA hits. In addition, Sirhan seemed drugged and disoriented, suggesting that he may have been hypnotized, as part of the CIA extensive mind control operations that were in development. In that case, Sirhan – described by those who know him as a lifelong meek individual who suddenly seemed in a perpetual trance – would have been what had become designated in such plots as the ‘throwaway,’ a drugged or hypnotized decoy placed at the scene for purposes of distraction to the actual, more effective, professional assassination. There has been similar speculation as well, about JFK assassin, Lee Harvey Oswald. Ironically, these covert mind control methods instituted as global psychological warfare by the US, figure heavily in the new Indiana Jones And The Kingdom Of The Crystal Skull, but the accused culprits are instead the Soviets. Not unlike the inexplicable Guantanamo style waterboarding of the US arms dealer (Robert Downey Jr.) by the Afghan resistance in Iron Man. And just as troubling, according to the filmmaker, is that this mountain of potential evidence continues to be accumulated, with no steps taken to reopen an official inquiry. Wouldn’t that be far more important than, say, hounding Hillary for her RFK assassination remark? Conspiracy theory or coverup? 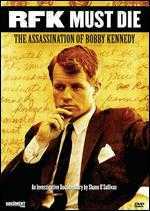 RFK must Die, unnerving documentary noir, and a potent and disturbing expose. RFK Must Die will be screened in California on 6/2 at the Crest Theater in Sacramento, on 6/3 at the Roxie in San Francisco, and 6/5-12 at the Pioneer Theater in NYC. The filmmaker will be present for Q&As at the screenings. And the film will have its television premiere on the Documentary Channel, 6/9 at 8pm. The accompanying book, Who Killed Bobby, will be released 6/5 by Union Square Press.